Nikon Aculon AL11 LRF Rangefinder. This rangefinder is one of the lightest and most compact around, easily carried in your pocket. 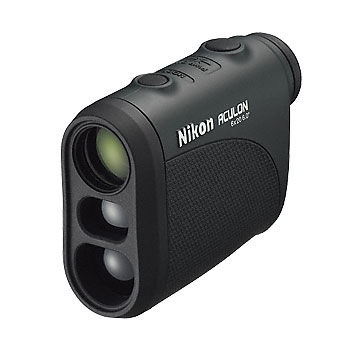 Features Nikon's distant target priority software for displaying the furthest target among multiple results with a single measurement. This allows for instant and accurate measurement of distances up to 500 metres/550 yards in 1 metre/yard increments. High quality 6x magnification and multilayer-coated glass ensure a clear and bright view. Weighing just 125 grams, it is a barely noticeable addition to your equipment. Highly portable and intuitive in use. Sold under Nikon name . A very useful item for nature watching photography DIY outdoors and field sports. Does everything I want. Clear and easy to use. Excellent no frills rangefinder that does what you want i.e. tell you the range! Great service from Uttings once again why buy anywhere else.